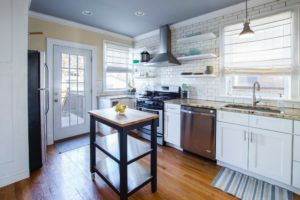 Now that 2019 is in full force, it’s time to think about some of the trends we will see in home remodeling. As the New Year gets underway there are certain trends that have begun in 2018 and some new upcoming trends that will be outstanding in 2019. In the Powder Room drams and bold designs are ahead of the class. Black walls are dramatic with printed geometric or floral porcelain floor tiles, and mosaics for the encore. Black fixtures and accessories dominate. Black will be the new white as cabinet manufacturers produce door style and accessories in matte black. The plumbing industries have included matte black in bath and kitchen faucets, shower fixtures, accessories and even black granite sinks. Black or darker counter tops add more depth and color to the kitchen. Enclosed wet rooms in the bathroom, tub and shower all in one frameless glass enclosure, give a spa experience. You have a free standing sculptured tub in a surrounding that you don’t have to worry about water spillage or leaking floor mounted hardware. Tubs will be making a comeback in 2019. Look for muted bright colors that are highly saturated but with a tint or shade that will make them more subdued. Muted blues and greens will lead the color palette. Open shelving is a trend that has been carried over from last year. 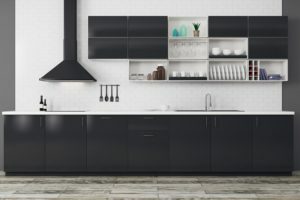 However in 2019, unique upper open shelving ideas such as metal open shelves, upper cabinets with open shelving or no upper cabinets will be an alternative to wall cabinets. These open shelving designs can be used not only in the kitchen but in the bathroom as well. As trends come and go, design your room with a professional who can create a space that you and your family will enjoy for many years. This entry was posted on Tuesday, February 12th, 2019 at 2:19 pm. Both comments and pings are currently closed.